...... Macs running 10.5, as well as Linux systems. Handbrake For Mac OS X can now include subtitle tracks that can be turned on and off, instead of rendering them onto the video track permanently (which also reduces video compression). This means you can include Closed Captioning data from DVDs and TV broadcasts, or find SRT text subtitle files on the 'net and include them. When using the Matroska container, you can also store the graphical subtitle images (VobSubs) from a DVD as a separate track. An added benefit is that multiple subtitle tracks can be included in the same output video. DVD to MPEG-4 converter, available for MacOS X, Linux and Windows. 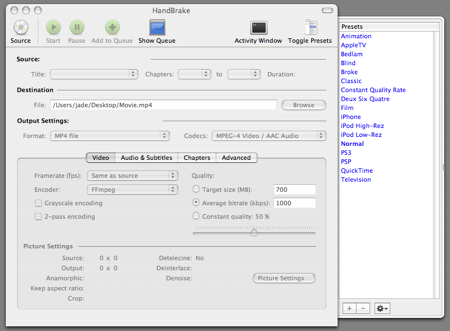 Qweas is providing links to Handbrake For Mac OS X 0.9.4 as a courtesy, and makes no representations regarding Handbrake For Mac OS X or any other applications or any information related thereto. Any questions, complaints or claims regarding this application Handbrake For Mac OS X 0.9.4 must be directed to the appropriate software vendor. You may click the publisher link of Handbrake For Mac OS X on the top of this page to get more details about the vendor.